A free cloud-based reverse SSH service. 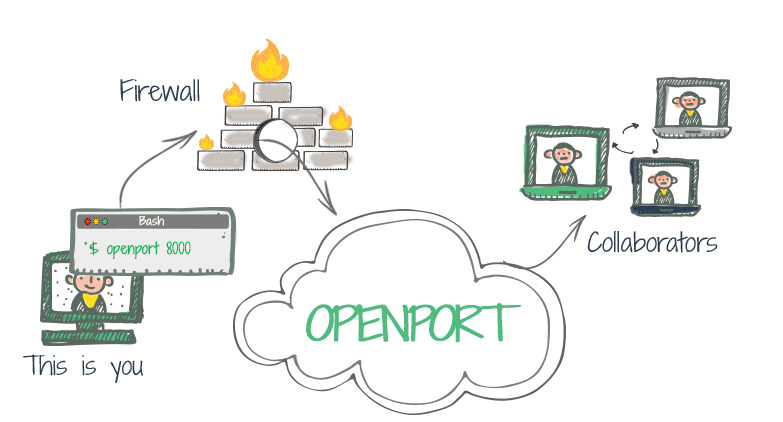 Openport builds a tunnel from your machine to the outside world, so your friends can connect to your services or files directly. Don't worry about firewalls, DNS or FTP. Are you stuck behind a firewall? Do you want to show people your work? Do you want to easily share files? Does your IP change frequently? Use Openport! Want to show your site to your clients before it's finished? Use Openport! Simply open the port your are using to develop the site (usually 8000 or 8080) and your client or friends can see the site before it is live to the public. Are you running linux? Setup ssh on your pc or server, open port 22 and connect to your pc using "ssh openport.io -p <my port on openport>". Now you can access your pc from anywhere in the world, and not just your LAN. Using VNC you can share your desktop in your LAN. With openport you can open the VNC port (default 5900) to the world. Set it up once, and leave it running. You never know when you will need your PC remotely. Follow the instructions below to download and install Openport. Use the buttons below to download the Openport version that is right for you. Double click the installer and follow the instructions. That's it! Now you can start sharing your ports. Simply enter the following command on the command line. Don't forget to replace the port by the one you want to share! Choose the package below that best fits your needs. You can cancel or upgrade your subscription here.